IT-manager's Life (English): How to print together multiple documents and files (PDF, DOC, XLS, DWG) or photos (JPG, BMP, PNG)? How to print together multiple documents and files (PDF, DOC, XLS, DWG) or photos (JPG, BMP, PNG)? 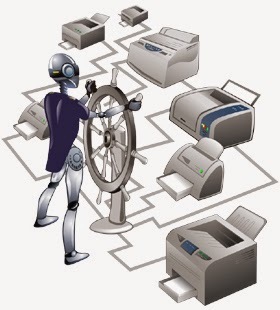 Do you need to automatically print multiple documents, present in a folder, without opening them? On Windows 98, XP, VISTA there is not natively a function like that, so you need to use a third-party software. Print Conductor is an utility that do this and I tried! It works very well and it's free! You must download and install the software application, then you create the list of files to be sequentially printed by selecting the files with the dialog box "Open File", or dragging them with drag and drop, or by automatic scanning of a specific folder. You can also choose different folders or files of different types from those available. XPS, SVG, TXT, WRI, RTF and HTML files. Also, you can change the configuration of the printer selection before starting the printing process. WARNING: The only condition you must abide is that on your PC, you must have already installed all the applications you normally use to open the same documents that you would like to print automatically. 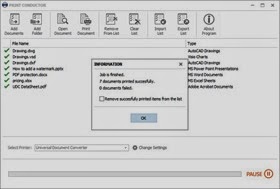 So for example, to print CAD files (DXF or DWG), you must have installed AutoCAD, to print Word or Excel files you must have a suite of Office installed, to print PDF files you must have Adobe Reader pre-installed, and so on. The free version of Print Conductor has no limitation of use., but insert a page of advertising in the print queue of your printer. Commercial version doesn't print advertising pages. Print Conductor works well on 32-bit and 64-bit versions of Microsoft Windows XP, Windows Vista, Windows 7, 8 and 8.1. Microsoft Windows Server 2003, 2008 and 2012 are supported, too. If you have Windows 7 or later you can use this convenient feature natively in the operating system. Just open the folder containing the file to be printed and select those that interest you. To select multiple files with the mouse at the same time hold down the SHIFT key if they are contiguous instead if there are NOT contiguous hold the CTRL key. Immediately after you click on it with the right mouse button and select the item Print in the context menu. The important thing is that all the files must to be of the same type and NOT to be mixed (only PDF, only WORD, only EXCEL, etc..) The only downside is that the files are sent to print directly to the default printer, and then you can not choose your printer from the menu. With this method, normally you can select up to 15 files contemporary to print. An alternative method, with Windows Seven, is to search for the printer on "Devices and Printers" in the Start menu. Click with the right mouse button on the selected printer, then select "See what's printing" in the context menu. When appears the "queues" window of the printer, that you have chosen, you can drag and drop the files to print. Then another dialog box will appear asking if you want to "print multiple files at once." By clicking on 'Yes' all the files will be opened and printed in their entirety, with the default settings. With this method it is possible to mix different types of files! This method does NOT have limits on the number of files to be printed simultaneously. Print Conductor is intuitive to use and effective, I like it very much!